The Bahá'í community has had a presence in St. John’s since Confederation, but its connections with Newfoundland and Labrador go back much further. The first woman in the western world (i.e. outside the Middle East) to become a confirmed believer in the Bahá'í Faith was Kate Cowan Ives (1863-1927) in 1894/95 in Chicago. Her parents were John H. and Catherine Cowan from Newfoundland, who left for "the Boston states" sometime before her birth in Orleans, Massachusetts. She lived in the U.S. all her life but is known to have visited St. John's in 1917 with another Bahá'í, the New Brunswick-born artist Marion Jack. In 1913, `Abdu'l-Bahá, the son of Bahá'u'lláh, revealed a prayer for a "Mr. Crowe of Newfoundland" (possibly Harry Judson Crowe, philanthropist and founder of several lumber companies in central Newfoundland). Early in 1914 Agnes Clift (Mrs. J. A. Clift) gave a talk about "Bahaism, a Persian religion that espouses a universal faith" to the Current Events Club at the Ladies Reading Room in St. John's. The talk was printed as a full-page article in the Daily News on Jan. 17, 1914. The Bahá'í community was formally established in this province in 1949 when three Bahá'ís from mainland Canada settled in St. John's. As the local Bahá'í communities grew large enough, Spiritual Assemblies (elected administrative bodies) were formed in St. John's (1969), Corner Brook (1971), Mount Pearl (1971), and Happy Valley-Goose Bay (1989). In 1983, the House of Assembly unanimously passed a legislative amendment granting official recognition of the Bahá'í marriage ceremony. Bahá'ís live in 18 localities across the province from Nain to St. John's. They come from diverse backgrounds including Innu, Inuit and Mik'maq. Most of the Northeast Avalon Bahá’í community now consists of Newfoundland-born believers – though there are also believers from a variety of places such as Iran, Sri Lanka, Malaysia, Armenia, Azerbaijan, England and Mainland Canada. Bahá'ís are represented in a wide variety of trades and professions in the province and several have won distinction for their contributions to the arts and sciences. A number of Newfoundlanders have served, or are serving as pioneer teachers of the Bahá'i Faith while employed in other parts of the world such as Africa and the West Indies. 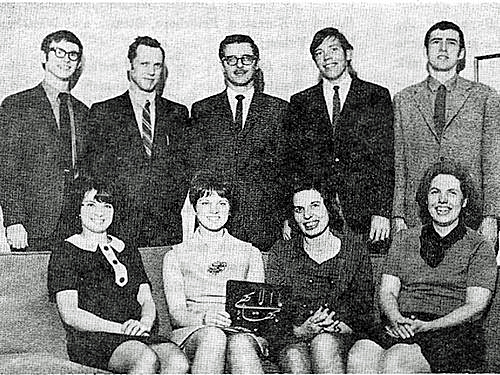 The first local spiritual assembly in St. John's was formed in 1969. Its members included (front row, l-r) Nancy Flynn, Dianne Stogre, Edwyna Noble and Elizabeth Rochester; (back row, l-r) Brian Minielly, Calvin Noble, Michael Rochester,Steve McLean and Tom Flynn. endear us in Thine eternal Kingdom. enrich us through Thy heavenly Treasury. inform us of Thy mysteries. quicken us with the breaths of the Holy Spirit. set us ablaze with the Fire of Thy love. Suffer the drop to become an ocean and the seed a harvest. Verily, Thou art the Giver, the Generous, and the Mighty!